Beth Dooley: First Local Food of Spring - How Sweet !! First Local Food of Spring - How Sweet !! Maple sugaring is our sweet farewell to winter. Crews of friends head into the woods to tap maple and birch and boil the sap to thick liquid gold. It's all-consuming work that requires hours of standing and stirring over open kettles, faces flushed with the steam, sipping maple coffee, maple hot toddies, and tossing syrup on snow for crackling candy. Syrup is the first real harvest of the season that can see us through the year. 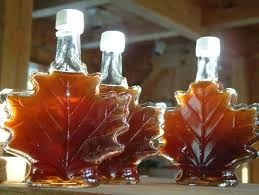 Nothing compares to the slightly smokey flavor of real maple syrup boiled over an open fire. In these two simple recipes, the flavor shines. I keep big jars of this on hand for salads (especially wild rice salad), to baste roast chicken, or drizzle over pork chops as they come off the grill. Put all of the ingredients into a blender, except the vegetable oil and process. Gradually add the oil in a slow steady stream. It's really important to use great maple syrup in this very simple old fashioned dessert. In a medium sized saucepan, warm the syrup, then whisk in the egg yolks one at a time. Bring the mixture to a simmer and cook, over low heat, stirring constantly until thickened (it will lightly coat the back of a spoon). Remove and allow to cool. Beat the egg whites until they hold stiff peaks. Whip the cream. Fold both the egg whites and cream into the maple mixture; don't overmix -- there should be streaks. Pour this into individual glasses or into an 8 x 8-inch pan. Put into the freezer to chill until very firm but not frozen and cut into squares to serve. (You can make this ahead, freeze, then remove from the freezer to soften before cutting and serving).